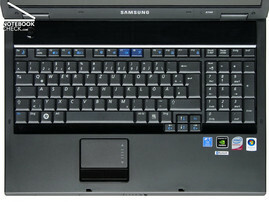 Samsung's R700 Aura T9300 Dillen, a 17 inch notebook, offers a lot of performance at a moderate price. This thin 17 inch multimedia notebook comes with powerful and modern components and weighs just 3.1 kg. Due to an overall high performance, the R700 is also fit for demanding applications and computer games. Desktop PCs go out of fashion. Today's 17 inch notebooks can be easily used as home cinema and for computer games. So, they are capable of replacing run-of-the-mill desktop PCs. Therefore, 17 inch notebooks are sometimes called desktop replacement notebooks (DTR). Reasonable 17" beginner notebooks, which cost between 600.- and 800.- Euro are also affordable. However, you should not expect high calculation and 3D performance of these. At about 1000.- Euro you already get multimedia notebooks with 17 inch LCDs which are ready for computer games. But, DTRs with built-in TV tuner and display which supports full HD resolution, and high-end gaming notebooks cost about 2000.- Euro. The R700 Aura T9300 Dillen is available for about 1300.- Euro. 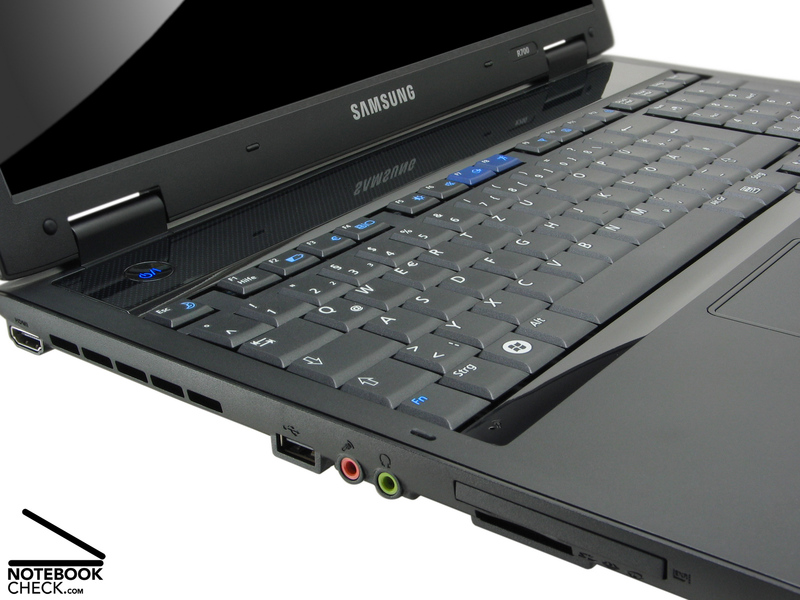 Samsung designed this notebook, which is equipped with a most up-to-date CPU by Intel and a middle-class video card, a Nvidia GeForce 8600M GT, for multimedia applications and some relaxing games. The following article covers whether this design goal was met. 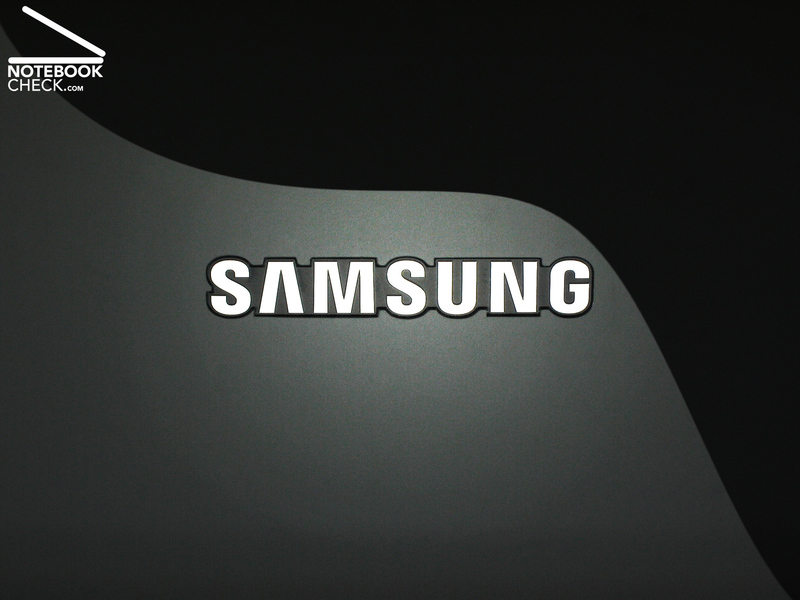 The Samsung R700 Aura T9300 Dillen has a glossy black lid, which is sensitive to dust and fingerprints . Fortunately, the accessories include a microfibre cloth. Unfortunately the glossy double clear-coat finish is also sensitive to fine scratches. Although the mighty lid looks solid, pressing against the back side results in clear changes on the powered display. The design is simple, the matte inside a matter of taste. Compared to innovative designs, like of the Acer Aspire 6920G for example, the Samsung R700 Aura T9300 Dillen looks unremarkable and unimaginative. Also the glossy ornaments do not change this. 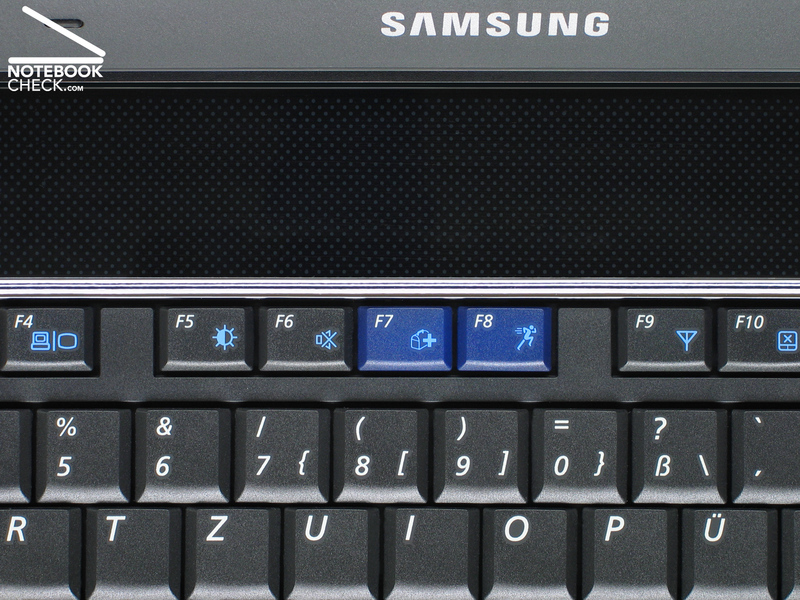 Furthermore, the Samsung R700 Aura T9300 Dillen does not have any hot keys for multimedia control. The only advantage of this 39.5 cm x 28.0 cm x 4.2 cm big desktop replacement notebook is its weight. Weighing just 3.1 kg this 17 inch notebook is rather light. The case of this big 17 inch notebook is very thin for a notebook of this category. Apparently, the stability of the base construction is rather low because of this design. If you pick this notebook up, it clearly distorts and audibly creaks. Many other comparable 17 inch notebooks are clearly ahead in this aspect. But, accuracy of fit and workmanship are good. The Samsung R700 Aura T9300 Dillen has four USB-2.0 ports, headphones and microphone sockets. A FireWire port and a S-Video out are missing. But, the R700 Aura offers an HDMI interface (High Definition Multimedia Interface) for transmitting uncompressed digital streams (audio and video). Modern PC expansion cards are supported by the ExpressCard/54 slot. Furthermore, it can also handle the wide-spread flash memory cards, whereas it supports the following formats: MultiMediaCard (MMC and MMC Plus), Memory Stick Standard and Pro (MS, MS Pro), Secure Digital (SD and SDHC) and xD-Picture Card (xD). The built-in 1.3 mega-pixel web cam with integrated microphone can be handy for messaging services and video chats. In regards to communication, the R700 Aura T9300 Dillen offers everything required. 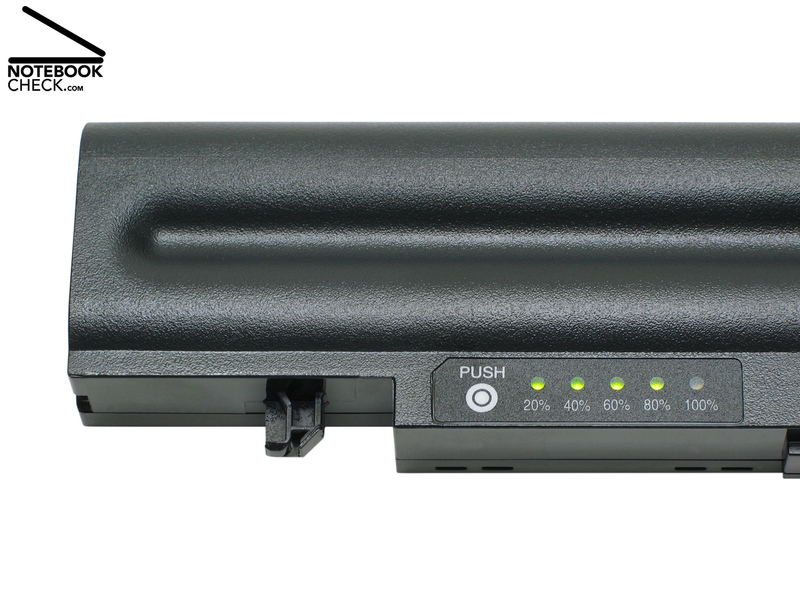 Modem, fast Gigabit-LAN, wireless LAN which supports draft-n standard (300 MBit/s) or fast Bluetooth v2.0 EDR are available. 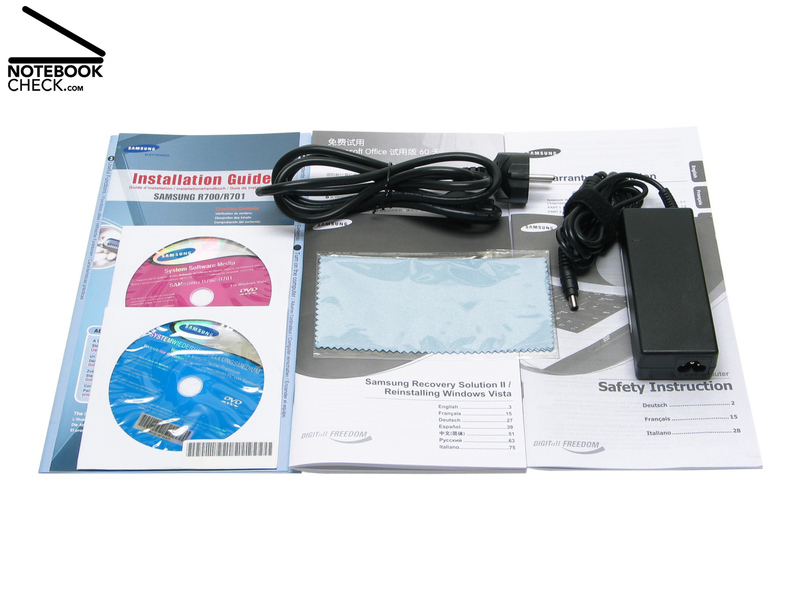 Great: The accessories include besides manuals and a microfibre cloth also a system recovery DVD for Microsoft Vista Home Premium and a system and media software CD. Unfortunately this has become unusual these days. Furthermore, recovery of the R700 Aura is easy, because there is an additional hard disk image. You just need to launch the Samsung's Recovery Solution II and you'll already have the system up and running again after about 20 (!) minutes. 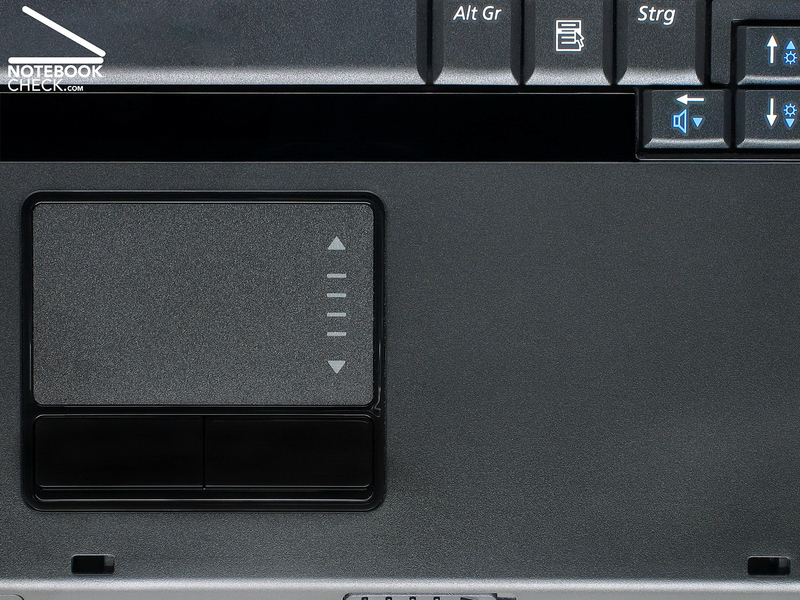 The R700 Aura doesn't offer any hot keys for quick launch of system functions. Also multimedia buttons, which would ease controlling the media player or other music and video software, are not available. 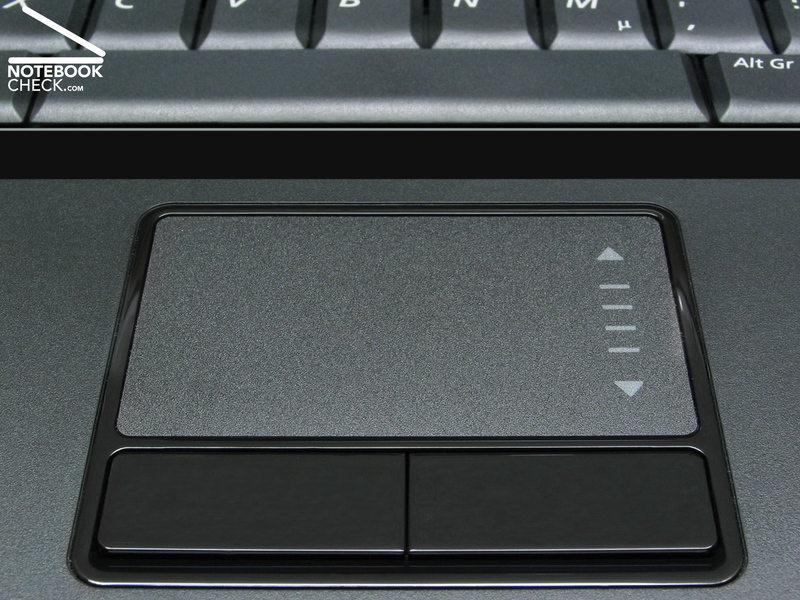 Frequently used system functions have to be launched by using a Fn key combination. 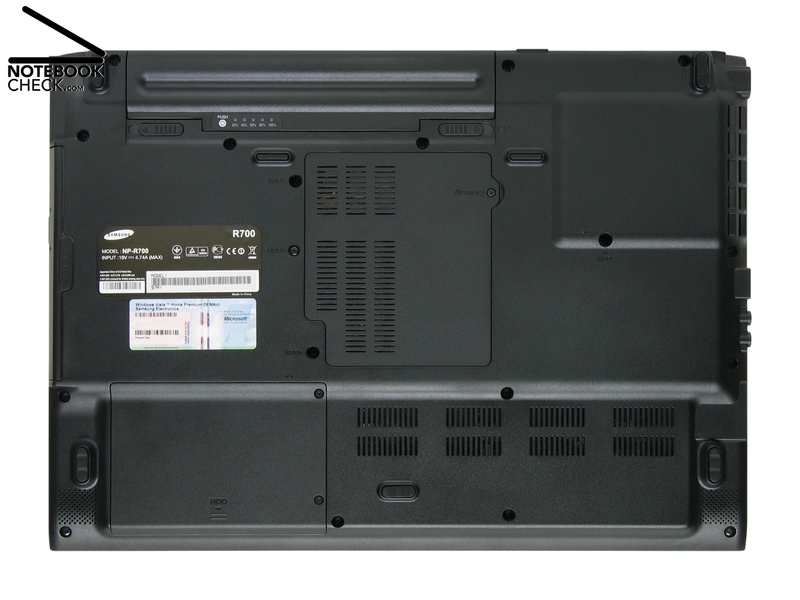 Samsung utilizes the big space of this 17 inch notebook. 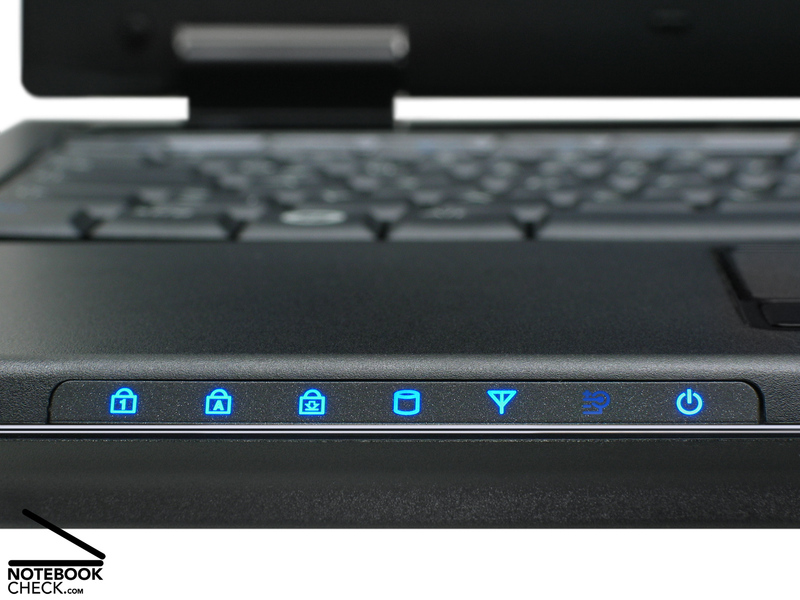 The R700 Aura T9300 Dillen has got a matte black keyboard with 101 keys and a numerical pad with four columns. 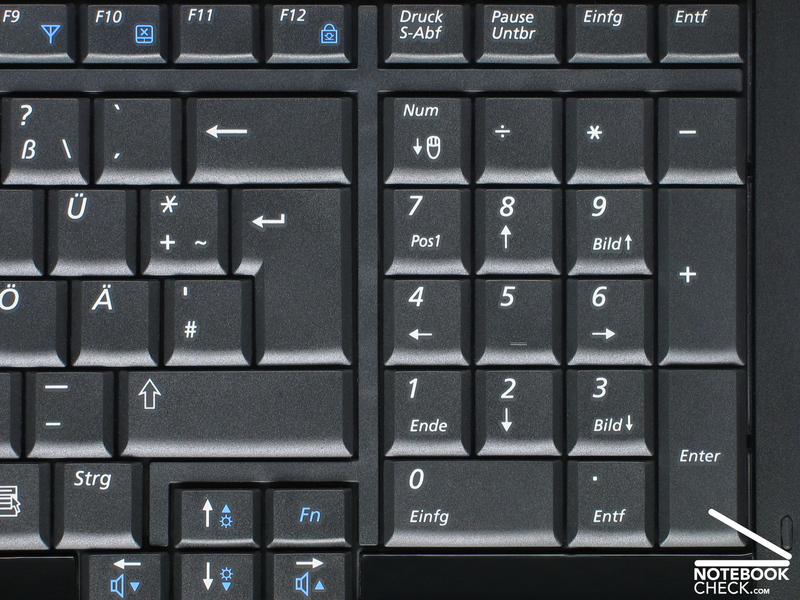 Except of reversely located Fn and Ctrl keys, the keyboard has a standard layout. The effective key head of letters is 1.4 cm x 1.5 cm big, which is alright for a 17 inch notebook. But, typing is not very user-friendly, because the key travel is long and the feedback not very clear. Furthermore, the keyboard gives during typing. 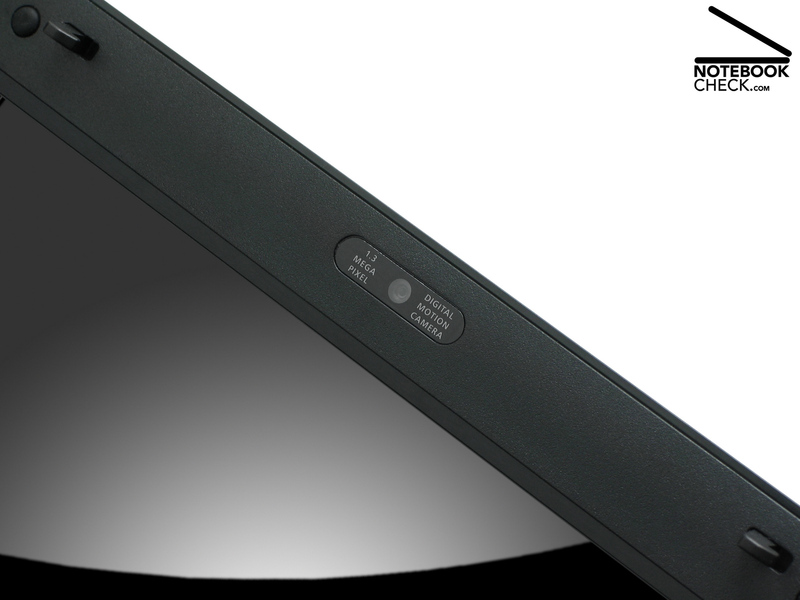 The touch pad is 7.0 cm x 4.2 cm big and allows to precisely control the mouse pointer. The visibly highlighted vertical scroll area increases the user-friendliness even more. But, the touch pad buttons are very loud and clatter. Mechanically they appear to be too wobbly too. They should be definitely improved by Samsung. The R700 Aura T9300 Dillen is equipped with a heavily reflecting SuperBright-LC display LTN170X2-L02, which is also made by Samsung. 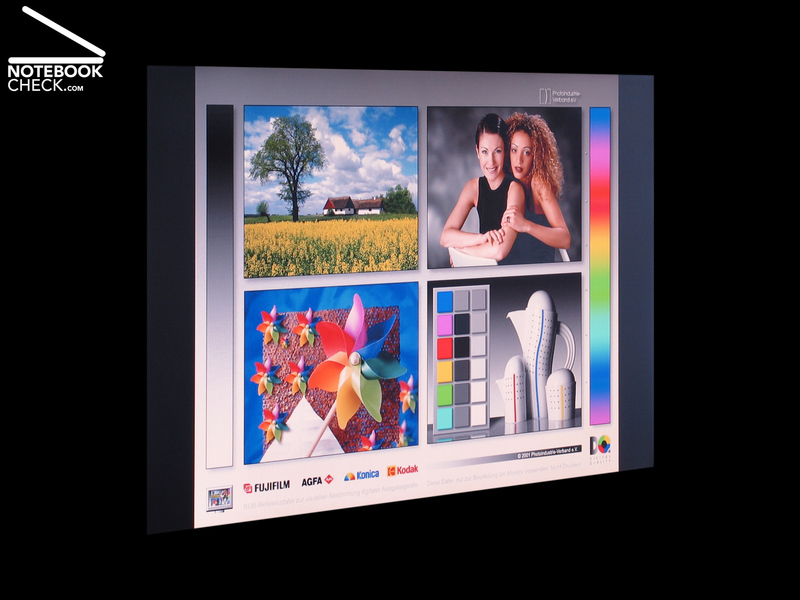 This WXGA+ LCD has a native resolution of 1440x900 pixels in a 16:10 aspect ratio. The measured average brightness of 172.2 cd/m² should be sufficient for desktop work. 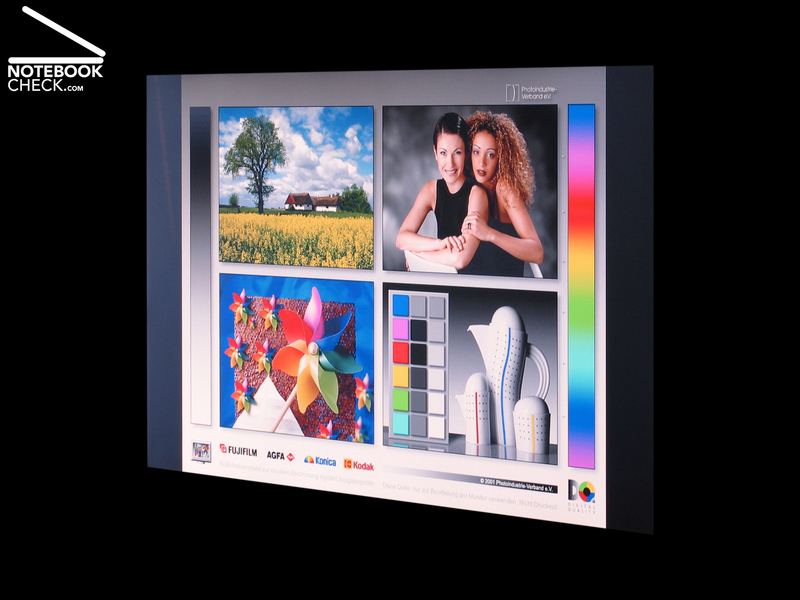 Nevertheless, the brightness is considering it is a 17 inch panel only average. The illumination is 80.4 percent. So, the R700 Aura T9300 is average in this aspect too. 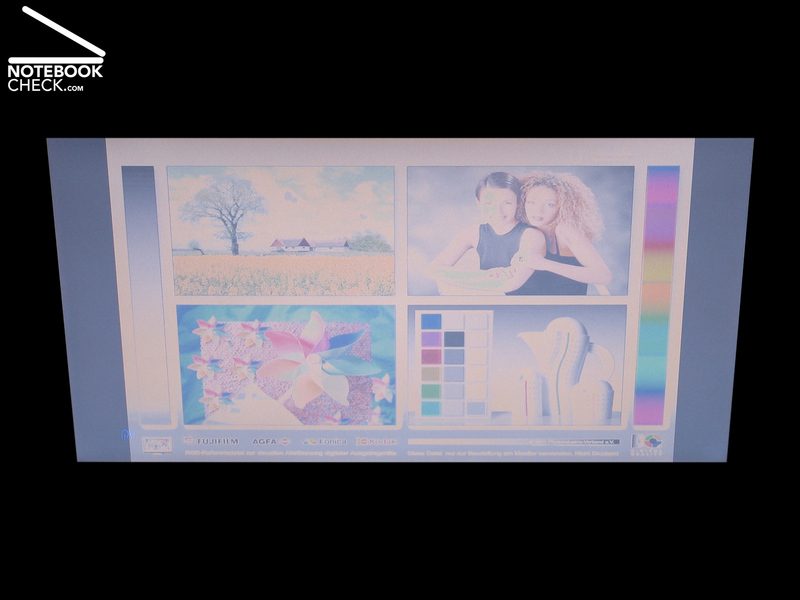 The brightness fades in the right bottom corner, were it achieves only 160 cd/m². So, the maximum brightness difference is nearly 20%. This conform to our subjective impression that the bottom area is clearly too dark. 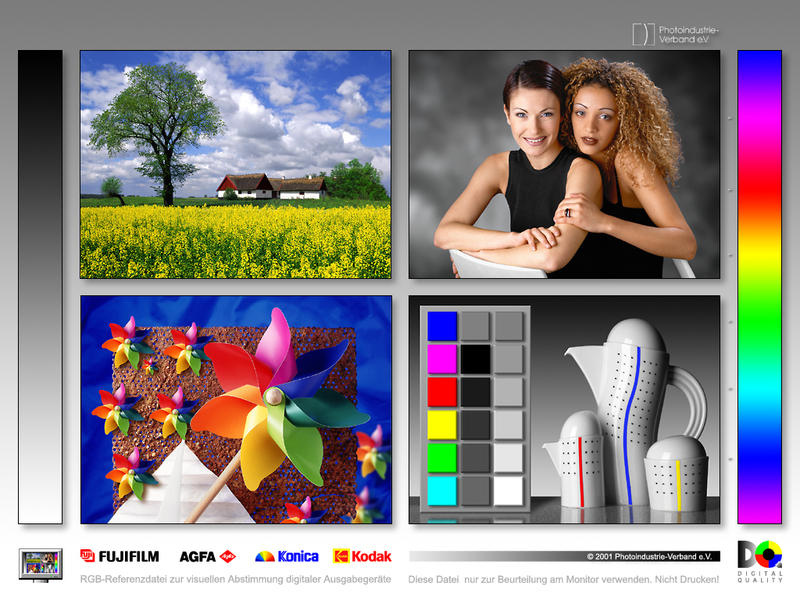 The contrast ratio is 249:1 in mains operation, whereas the minimum representable brightness (black value) is 0.8 cd/m². So, also the contrast is only fair average. 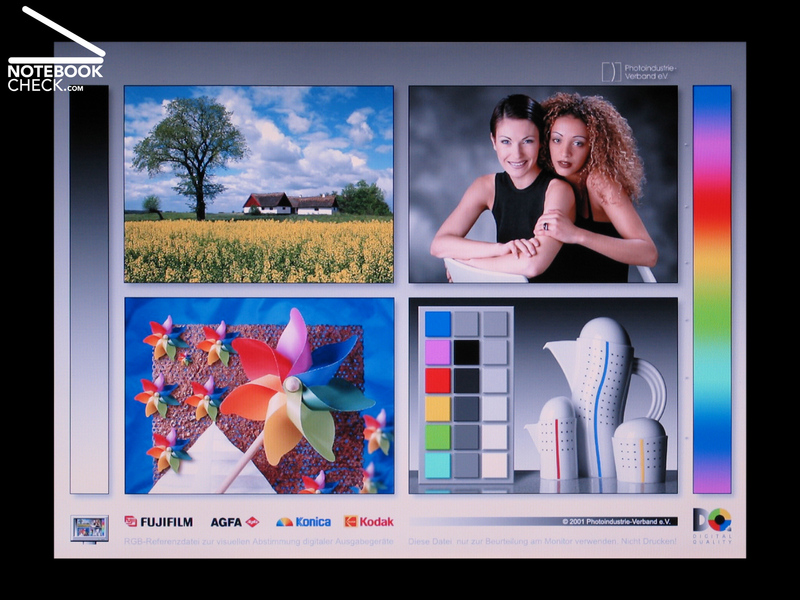 Directly compared to our 20 inch reference screen, a MVA-LCD Viewsonic VP2030b, the colours appear to be a little bit dull. Overall, the colours are not sufficiently brilliant for a reflecting screen and they appear to be rather cold too, because they also have a slightly blue tint. But, the contrast is subjectively good, if the viewing angle is ideal. 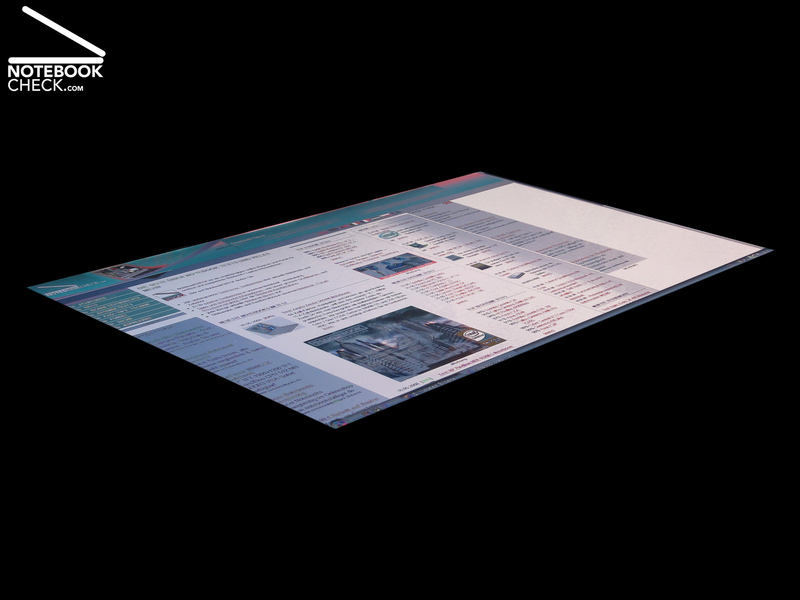 Outside the ideal viewing angles, the dependence on the viewing angle is compared to similar glossy panels fair average. 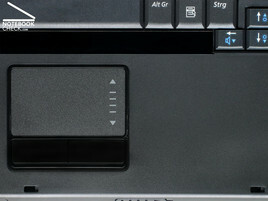 Computational power is the core strength of the Samsung R700 Aura T9300 Dillen. 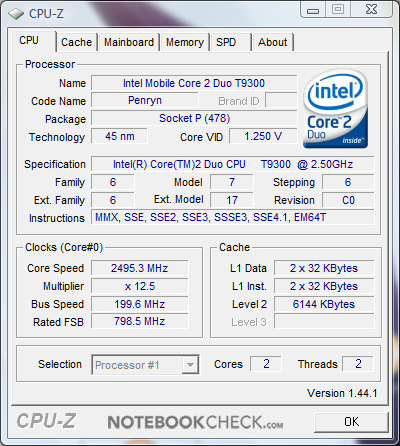 Even demanding picture and video editing are no problem for the Core 2 Duo T9300 (2,5 GHz) with 6 MByte L2-Cache. Intel's powerful Penryn-CPU and 3 GB RAM offer top performance for all applications - even with the demanding operation system Microsoft Windows Vista Home Premium. 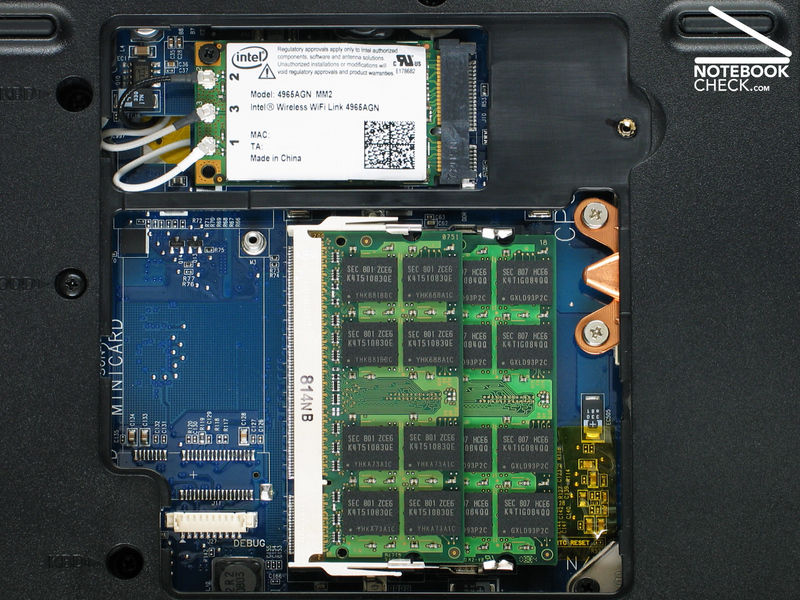 There are two fast DDRII-667 RAM modules inside, a 1-GB and a 2-GB module. 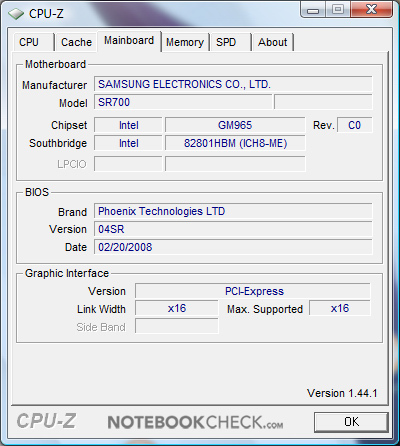 CPU-Z-Information about the Samsung R700 Aura T9300 Dillen Notebook. 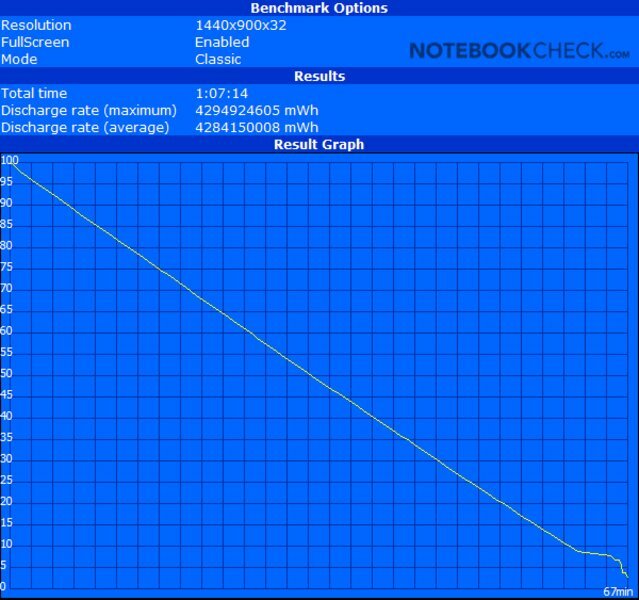 In the PCMark05 benchmark this notebook achieves 6109 points: This is a very good for the R700 Aura Dillen. The same is true for Maxon's Cinebench R10. 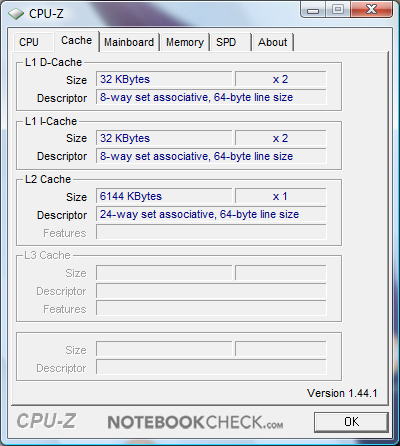 Here the fast core components achieve a CB-CPU value of 5165 in 'Rendering Multiple CPUs'. Furthermore, we did never feel that the performance is too low during picture and video editing. 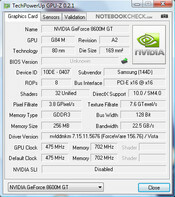 Despite a middle-class video chip, a GeForce 8600 GT by nVidia the video performance is still very good. The fast 256 MB GDDR3 video memory contributes to the powerful graphic processing in the synthetic 3D benchmarks by Futuremark. It seems that up to a resolution of 1280x768 256 MB are sufficient as texture memory. 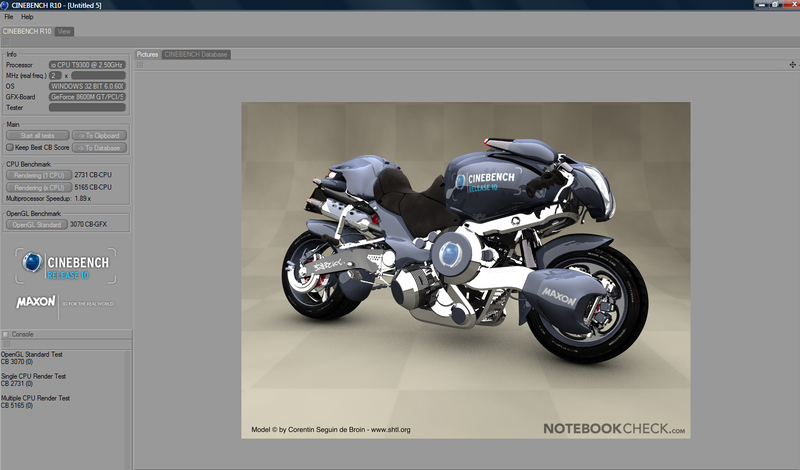 In the 3DMark06 this notebook achieves 4344 points - which is a really high value for a GeForce 8600M GT. In the 'shading' test of Cinebench R10 OpenGL benchmark the R700 Aura achieves also very good 3070 points. Data can be stored on the built-in 250 GB SATA hard disk by Hitachi. The Travelstar 5K250, model HTS542525K9A300, comes with 8MB Cache, which is typical for this category, and works at 5400 rpm. The average transfer rate of 44.0 MB/s, which we measured with HDtune, is good. The optical drive, a TS-L632H by TSST (Toshiba Samsung Storage Technology) is said to be capable of burning DVD-RAMs at up to 5x. 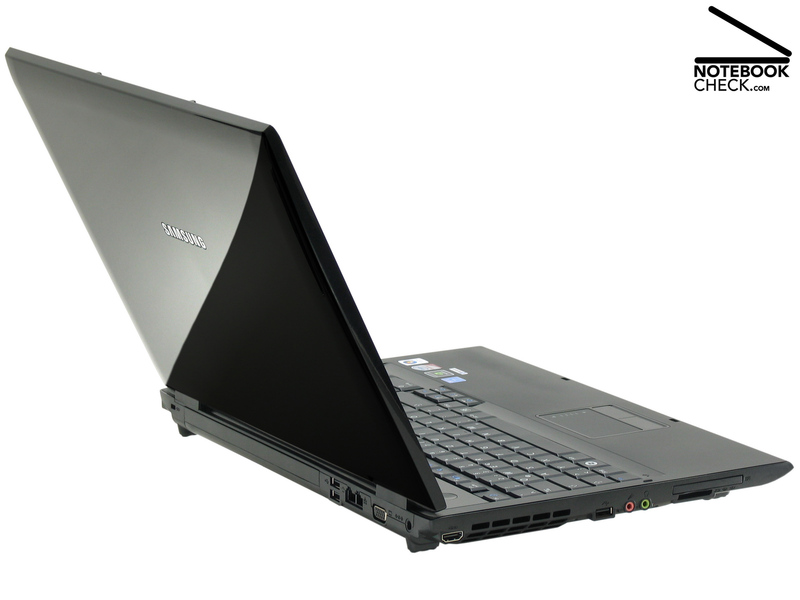 Also 17 inch multimedia notebooks are still frequently equipped with a GeForce 8600M GT, a middle-class video card. 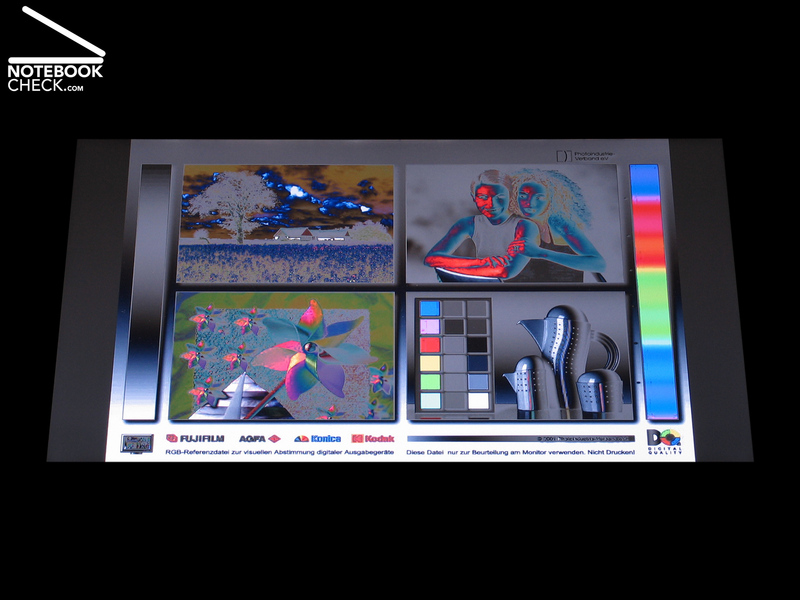 This video card is fit for 3D applications and can also handle older computer games with native resolution of 1440x900 pixels and highest level of details without problems. However, new demanding 3D games require reducing the resolution. In order to run Crysis or World in Conflict (WiC) smoothly, you have to reduce both, resolution and quality level. But, Ubisofts action adventure Assassins's Creed can be run in full resolution without problems. However, you need to do it without shadows and other graphical effects to run this impressive Middle Ages' adventure. In the clearing, the combination of GeForce 8600M GT and fast T9300 has a rather good gaming performance. 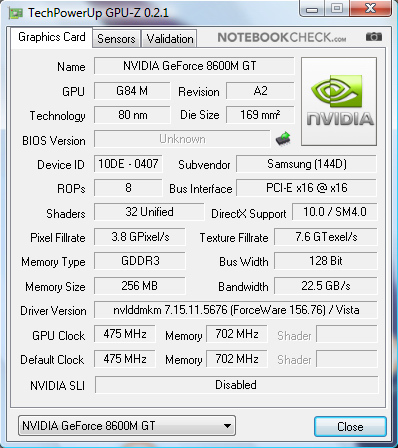 We used the ForceWare 156.76 (driver 7.15.11.5676) for the GeForce 8600M GT throughout our tests. 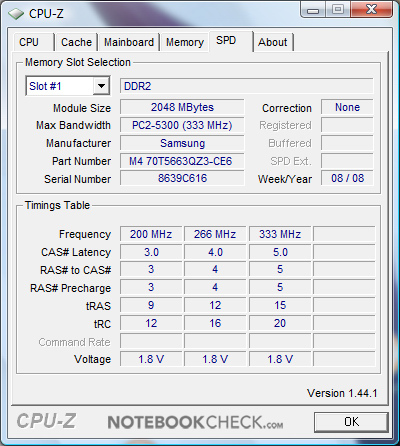 As already mentioned above 4434 points were achieved with this configuration in Futuremark's 3DMark06 benchmark. Older games, like 'Doom3' ran smoothly with 100.6 fps at 1024x768 pixels and ultra details. In 'F.E.A.R' the average frame rate is also 73 fps at a resolution of 1024x768 and at high quality level. In Crysis and WiC the GeForce 8600M GT achieves only playable frame rates at low quality level. 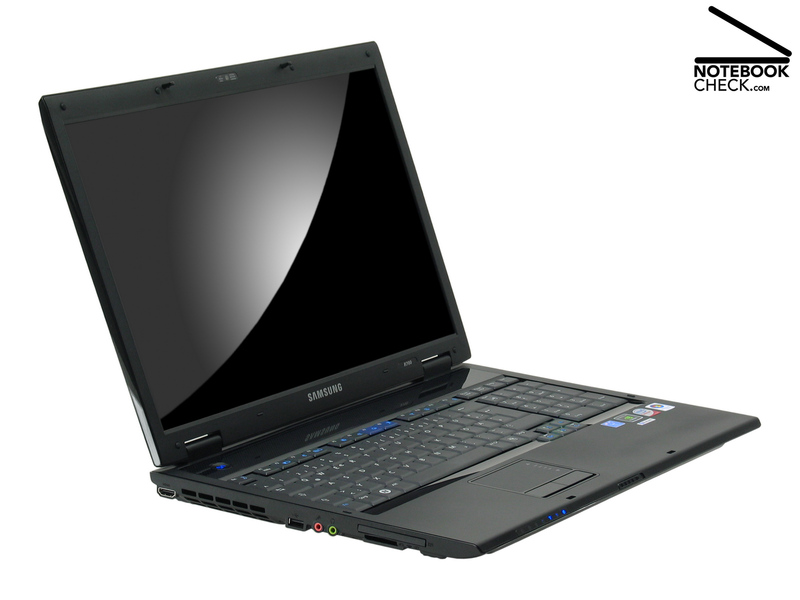 During continuous use for a while, the Samsung R700 Aura T9300 Dillen proves to be a very quiet notebook. Despite powerful core components, the noise level is only 33.2 dB(A) in idle mode, whereas the environment temperature was 23 degrees Celsius. Thereby the operating noise is a low frequency noise. Also under average load, e.g., simple picture editing, the R700 Aura does not get louder than 34.2 dB(A). Even under full load the noise level increases only moderately to up to 37.8 dB(A). It takes a while until the noise level reaches 40.4 dB(A), which is clearly audible, if you convert pictures or videos. Another advantage of the R700 Aura are its low temperature emissions. The temperature increase of this powerful 17 inch notebook is also lower than of many other notebooks of this category if you use it for a while - very good. We measured an average temperature of 31.4°C at the top side, whereas the maximum was 35.0°C. As expected the maximum temperature is higher at the bottom side, where we measured 39.1°C. But, the average temperature of 30.2°C on the bottom side is very low. (+) The average temperature for the upper side under maximal load is 31.4 °C / 89 F, compared to the average of 32.9 °C / 91 F for the devices in the class Gaming. (-) The average temperature of the palmrest area of similar devices was 28.7 °C / 83.7 F (-2.2 °C / -3.9 F). Customers usually expect that the sound of 17 inch notebooks is good. However, these are also only equipped with really good speakers if it is a high-priced notebook. The R700 Aura costs only about 1300 Euro. So, you should not expect an outstanding sound. This notebook has two tiny speakers, which are located left and right at the bottom side of the front edge. The sound is fair average without strong basses and passable middle tones considering these are notebook speakers. However, sound output via the analogue headphones socket is brilliant. We tested it with our reference earphones, Bose In-Ear headphones and could really enjoy the music. It is recommended to turn down the volume and turn off all sound modifiers before you try. 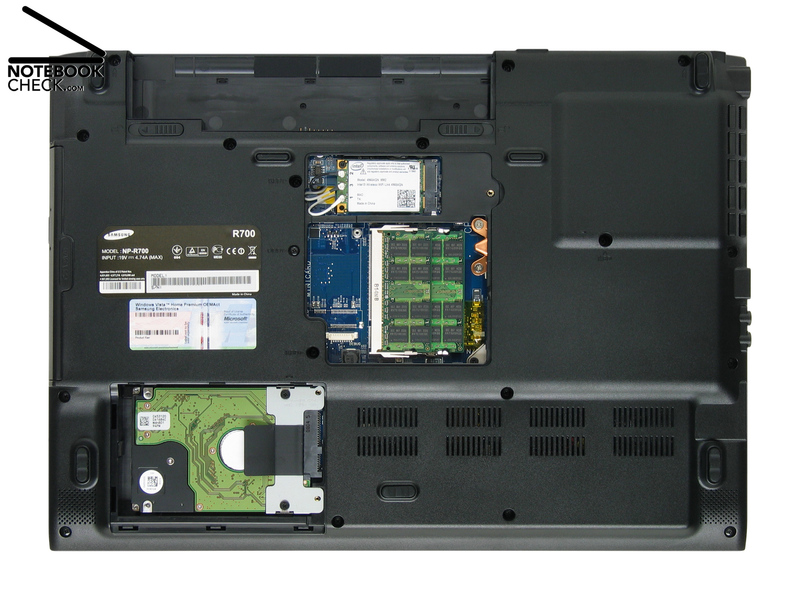 Despite powerful core components and high overall performance, the Samsung R700 Aura does not demand a lot of energy. In mains operation we measure 23.0 Watt (energy saving mode) and 34.9 Watt (highest performance) in idle mode. 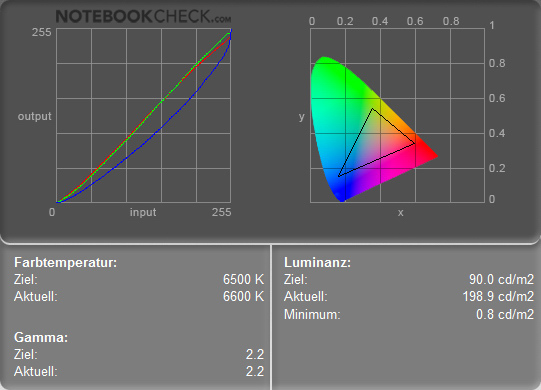 Only if we use the 3D test screen saver we measure 40.5 Watt in idle mode. The energy demand is 48.3 Watt with average load (Cinebench R10, one CPU core). This is absolutely alright for a Penryn notebook. 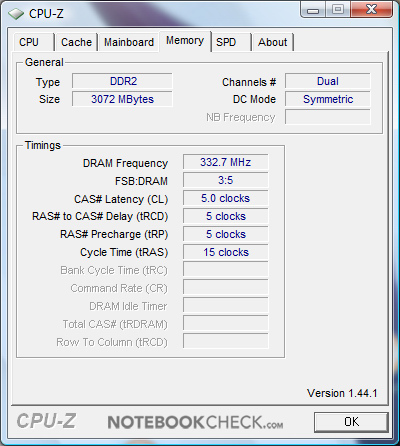 Although the measured maximum energy demand is 91.4 Watt (Prime95 and ATI tool), this notebook needs only about 74 to 75 Watt when playing computer games. Also battery mode is alright. 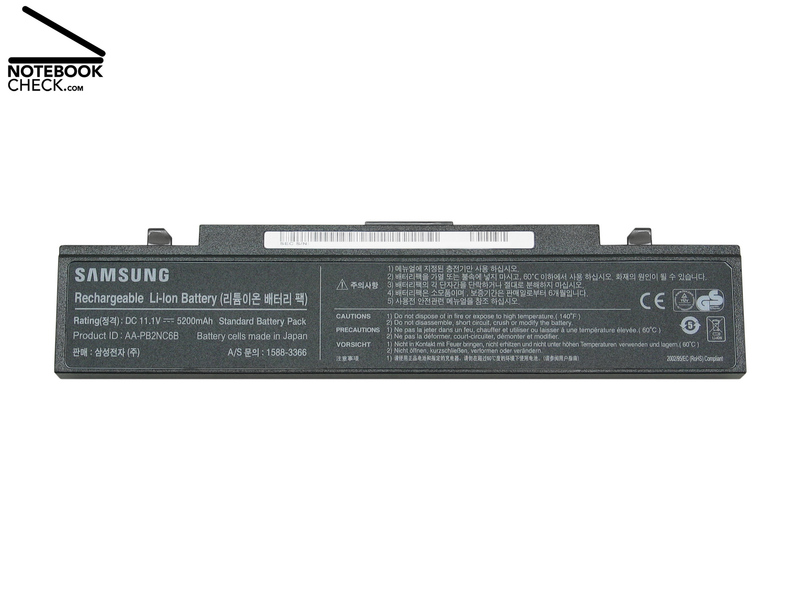 The Samsung R700 comes with a 6 cells battery with 52.72 Wh (5200 mAh) by default. The battery has a LED charge level indicator. 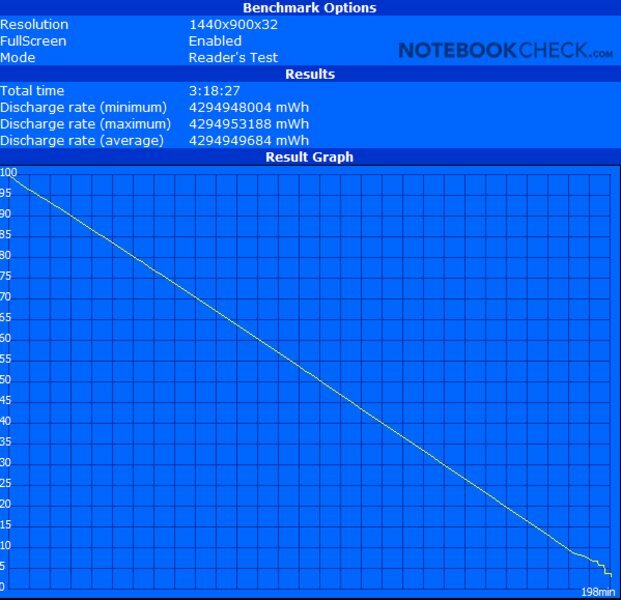 In the Battery Eater Reader's test this 17 inch notebook achieves at least 3 hours and 18 minutes runtime. In the Battery Eater Classic test the runtime falls to 1 hour and 7 minutes. If you demand a longer runtime, you should use the 9 cells high-capacity battery with 80 Wh (AA-PL2NC9B/E / EAN: 8808979869930). Samsung's recommended retail price for this battery is 209.00 Euro. 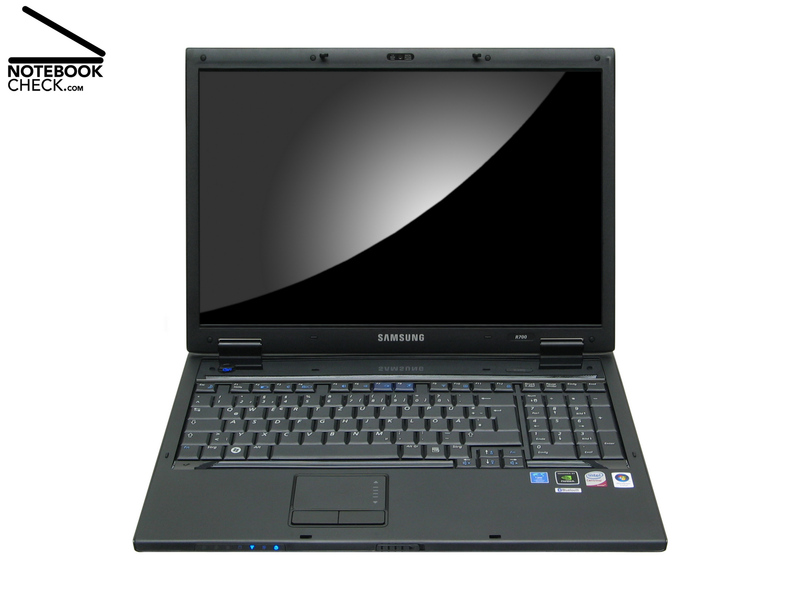 The Samsung R700 Aura T9300 Dillen is a reasonable 17 inch multimedia notebook with low noise and temperature emissions and high performance. It is fit for the future, because it is equipped with a HDMI out, which allows uncompressed transmission of video and audio data. 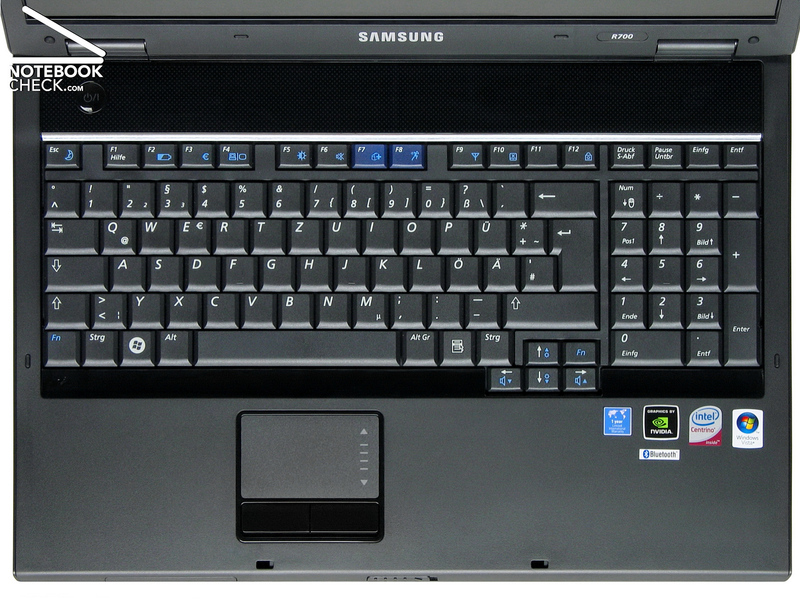 To summarize, the Samsung R700 Aura T9300 Dillen is a solid notebook, a good desktop replacement notebook. However, case, peripheral connectivity, and input devices are only average. It looses points, because the case creaks, the input devices are wobbly, and TV-out and FireWire port are missing. But, the weight of just 3.1 kg is oustanding. In this category the competition is active. The Asus G2SV, the Fujitsu Siemens Amilo Xi2550 and the Toshiba Satellite P300 all do not cost too much. If you spend some more money, the Asus G2SV provides a clearly better application and gaming performance. 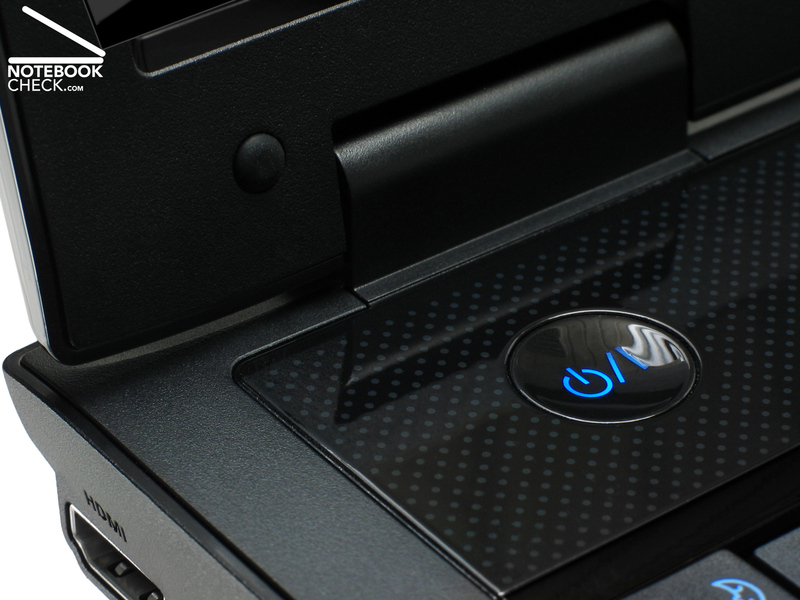 The Xi2550 is equipped with Blu-ray drive, eSATA, and better display. 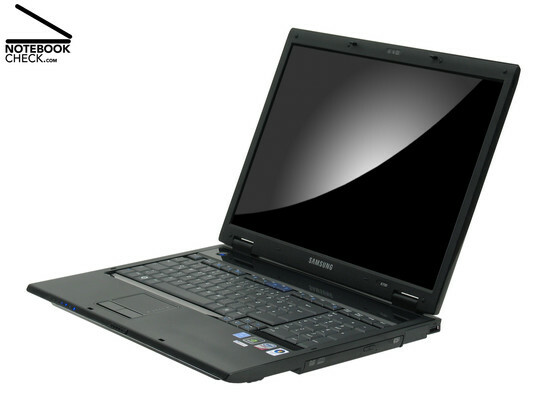 Toshiba's Satellite P300 scores points by better speakers, higher memory capacity, and lively design. Despite the competitors are also attractive, we especially liked the Samsung R700 Aura T9300 Dillen, because of its low emissions. If you require a low weight and low noise emissions and also high performance, you should take a closer look at the Samsung R700 Aura T9300 Dillen. We'd like to thank the company Notebook-Shop, who kindly provided us with the test machine for this review. The device can also be configured and ordered from their website. Super! The base equipment includes recovery media. And also the HDD-recovery works fast and without problems. In addition a micro-fibre cloth is available. 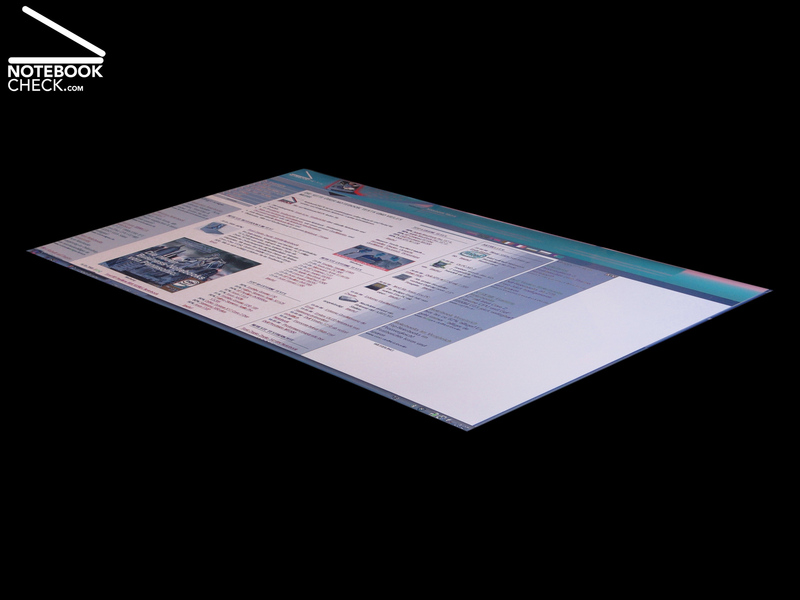 Display and also other surfaces are high-gloss. A lot of work for those you do not like cleaning. Except of a HDMI port the Samsung R700 does not have a big number and variety of interfaces. The picture quality of the web cam is not very good, but will suffice video chats. ... and that there is no way to access the fan for cleaning. Both RAM slots are occupied, one by a 1 GB module, the other by a 2 GB module. Although there is no plastic cushion between HDD and case, you can hardly hear the HDD. 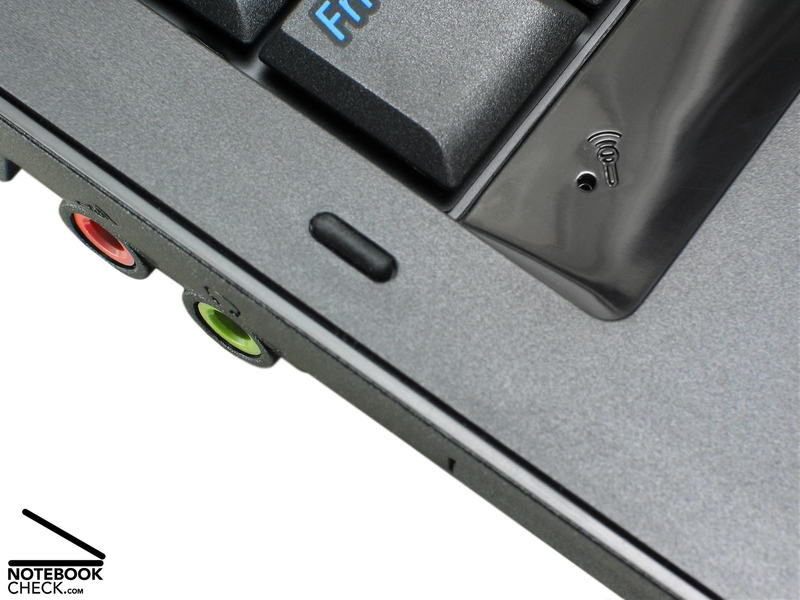 The microphone is in the glossy moulding below the keyboard. ...and also the other parts of the inside do not harmonize well with each other. ... and could be more resistant to force. ... and the case should not creak that much. We didn't like the feel of this keyboard, which is as big as a desktop PC keyboard. There aren't any hot keys. You have to use Fn key combinations instead. ... LED charge level indicator.